Determine what material your screen is made out of. Typically, screens are made out of either metal or fiberglass. While metal screens feel like metal, fiberglass feels much smoother and tends to be more flexible. Measure the size of the tear in the existing screen and purchase a larger piece of replacement screen that matches the color of the existing screen. Cut a rectangle or square piece of new screen at least 1 to 2 inches larger than the tear on all sides. You will need greater overlap for a larger patch. Unravel and pull strands of wire or fiberglass off of all sides of the patch; pulling horizontal strands off the top and bottom and vertical strands off the sides. Bend the extending strands at a right angle, facing the screen to be patched. Place the patch over the hole and then bend the extending strands flat on the reverse side of the porch screen to secure the patch into place. If the patch is made of fiberglass and doesn’t stay put on its own, apply a small amount of clear household glue to the strand edges after the patch is in place. 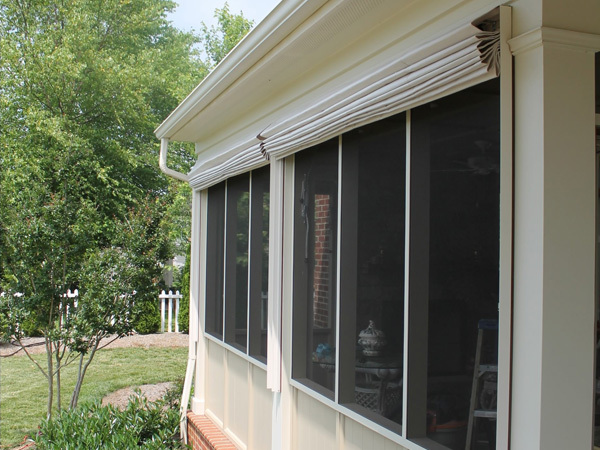 If you find that you are regularly dealing with tears in your porch screens (due to Mother Nature or pets scratching to come inside), you may want to consider installing screen porch shades. Not only will they help to protect the contents of your porch, they can also help to minimize tears due to harsh weather and everyday wear and tear. To learn more about screen porch shades, please contact us at Weather Queen Shades.